This interior was built as a drawing room overlooking the street. Of the three doors opposite the windows, the central one is a false door, designed to create a sense of symmetry. Mythological heads of Ceres (goddess of the harvest) and Bacchus (god of wine) in the frieze are appropriate as the room was used for eating. 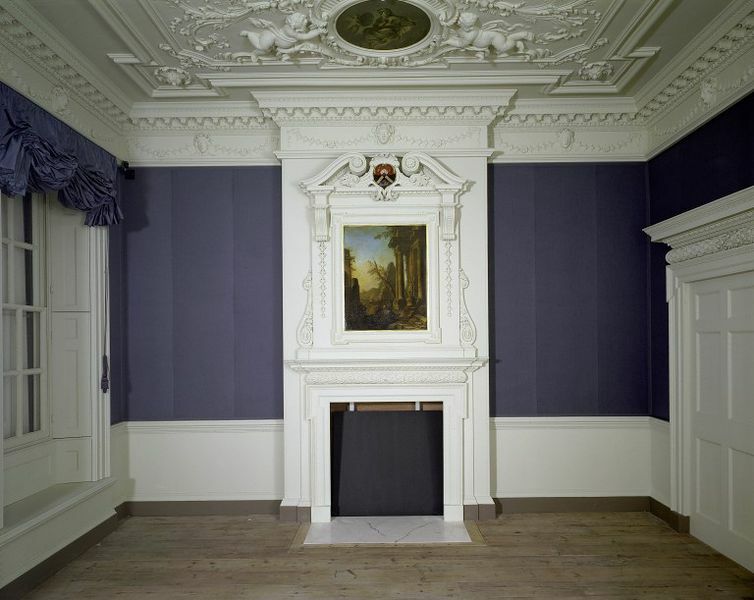 This is an important example of an architect-designed reception room from a smaller London house of the mid-1720s. It is the only surviving example of a town house interior designed by the architect James Gibbs. The street was named after Henrietta, wife of Edward Harley, 2nd Earl of Oxford, as the Marylebone estate where the house was built was acquired through this marriage. James Gibbs had also worked for the 2nd Earl's father, Robert Harley. Gibbs took leases out on four sites in Henrietta Street, nos. 5, 9, 10 and 11 and actually lived in no. 5 from 1731 until his death in 1754. This room is from no. 11. The five inset paintings, attributed to Vincenzo Damini, in the ceiling are executed in oil on plaster. The surrounding plasterwork was made by a team of Italian craftsmen. The door frames and overmantel are carved in wood. The door entablature is taken from the published designs of the Italian architect Andrea Palladio (1508-1580). The shield in the pediment is charged with the arms of Allen, Per fesse gules and sable, a chevron rompu between three griffin heads erased ermine. This records the second family to occupy the house. According to the Marylebone Rate Books,Thomas Allen of Finchley took up residence in 1775 and the family remained there until 1799. Designed by James Gibbs (born, Aberdeen, 1682, died, London, 1754); ceiling designed and modelled by Giuseppe Artari (born, Arogno, Switzerland, 1692 or 1700, died in Cologne, Germany, 1769) and Giovanni Bagutti (born, Rovio, Switzerland, 1681, died after 1730); panels in the ceiling painted by Vincenzo Damini (born in Venice, Italy, before 1700, died in L'Aquila, Italy, about 1749). Number 11 was built for the architect James Gibbs (1682-1754), best known for his design of the church of St Martin-in-the-Fields. Gibbs worked frequently for the Earl of Oxford and had designed the local church, St Peter's, Vere Street. He leased a site and built a house for his own use at number 5, as well as taking leases of three other plots to build houses as an investment. These included number 11, for which he designed this richly decorated room. During the 19th century Henrietta Street became less fashionable. By 1950 the house was used by small businesses and this room was let to a ladies' tailor. In 1956 the house was demolished and the site acquired by Debenhams department store, whose management presented the ceiling and woodwork to the V&A. The room before 1956. It was last used as a fitting room for a ladies' tailor. Such simplicity suggests that the walls may have been hung with one of the plain woollen fabrics that were often used in place of silk, although none survives today. Glazed mohair, a fine wool fabric, was often mentioned in 18th-century inventories for wall hangings. This modern version was woven in Scotland from worsted (wool) yarns and mohair from Turkish goats. After weaving it was glazed by passing it through hot rollers, giving it the lustre of silk. 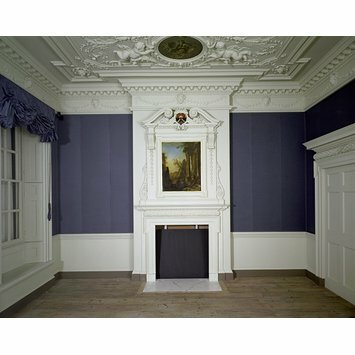 In the 18th century blue ranked third in status, after crimson and green, and was an appropriate colour for a fashionable but not grand room. The combination of modelled plaster with painted panels may have been a fashion that the architect James Gibbs learned to admire when he studied in Italy (1703-1709). The central panel shows Apollo, with Time Revealing Truth and Love Repelling Hatred. The four small panels represent the Arts.